ST. LOUIS, MO. Diehard Chicago fans on a road trip to St. Louis braved a non-stop rain that fluctuated from steady drizzle to torrential downpour. The elements seemed to affect the offenses of both teams, resulting in numerous fumbles, errant snaps and a scoreless first quarter. The first score of the game came early in the second quarter on a safety. Chicago (3-0) had just fumbled away a scoring opportunity on 4th and goal at the one yard line. The turnover on downs gave St. Louis the ball on their own one yard line, with the Force defense smelling blood in the water. On the Slam's first play Chicago's Angel Smith met the ball carrier in the backfield, bringing her down in her own end zone for a 2 point safety. Chicago's next possession was a sustained drive culminating in a 2 yard touchdown pass to WR Jeanette Gray. RB Brandy Hatcher punched it in on a 2 point conversion to give the Force a 10-0 lead with :46 seconds remaining in the first half. On the opening possession of the second half Force QB Sami Grisafe got in a groove completing multiple passes to Gray and Hatcher while mixing in running plays to Darcy Leslie. Leslie eventually powered it from the 2 yard line for her first score of the day. Dana Vermilye then converted a two point attempt by taking a direct snap and following a block into the end zone for an 18-0 lead. St. Louis returned the ensuing kickoff to midfield. On the next play Slam QB Kate Evers kept the ball and beat contain, going 50 yards down the sideline for a touchdown. The kick was good, pulling the Slam back into the game at 18-7. The Slam excitement was short-lived as Gray caught the kickoff at her own 20 yard line and split the kick coverage right down the middle for an 80 yard touchdown return. Tricia Charbonneau kicked the extra point to put Chicago back up 25-7 and you could feel the air come out of the Slam. The floodgates opened and Chicago scored 3 more touchdowns before the end of the quarter. Much of the carnage was the result of Chicago's strong defensive effort, which consistently gave scoring opportunities to a Force offense that at times struggled to control the line of scrimmage. The Force defense punished the Slam ball carriers, and sacked and harassed their QB throughout the game. Chicago DE Kim Marks had 4 tackles, 4 sacks and 2 fumble recoveries. LB Darcy Leslie had another stellar game with 9 tackles, an interception and a forced fumble. She also had 2 touchdowns on offense, and is the go-to option in critical situations. Lisa Kadelak made a splash in the second half with 2 tackles, a sack, and a 43 yard scoop and run fumble recovery. DL Taz Brooks, LB Candace Griffin and LB Mary Choules also made significant contributions on defense. The Force offense continues to impress. In spite of the adverse conditions, Grisafe finished with 22 completions on 35 attempts for 3 passing TD's and one rushing TD. 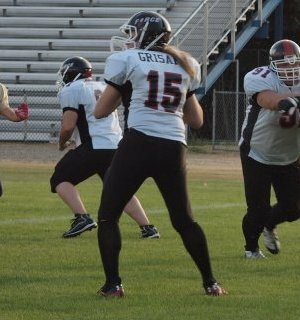 Her primary target and league-leading receiver is Gray, who had another monster game with 16 receptions for 219 yards and 2 receiving TD's, in addition to the kickoff return TD. The Force will travel to Kalamazoo next week to face the West Michigan Mayhem in a divisional game. The next home game will be June first when they take on the rival Kansas City Tribe at 5pm at Evanston High School's Lazier Field.